I’ve always wanted to make a fruit salsa but my family usually snubs their nose when I get creative in the kitchen. We picked up some chicken that was marinated in a mango coconut sauce at our friends new butcher shop and market, Southern Steer Butchers (US 19 and Curlew in Dunedin, FL), and this is the side dish that I prepared to go with the chicken. 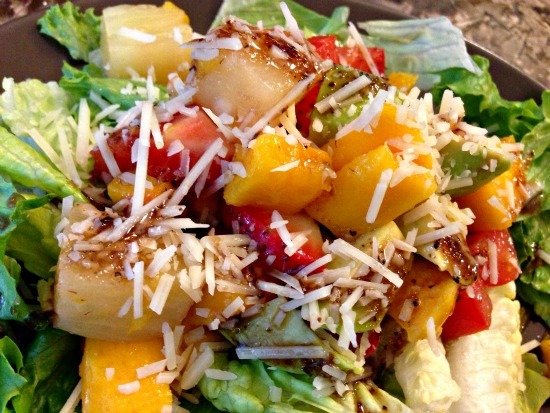 I served it over a bed of fresh romaine with a sprinkle of parmesan and balsamic vinegar to balance the flavor of the mango. DELICIOUS is an understatement! 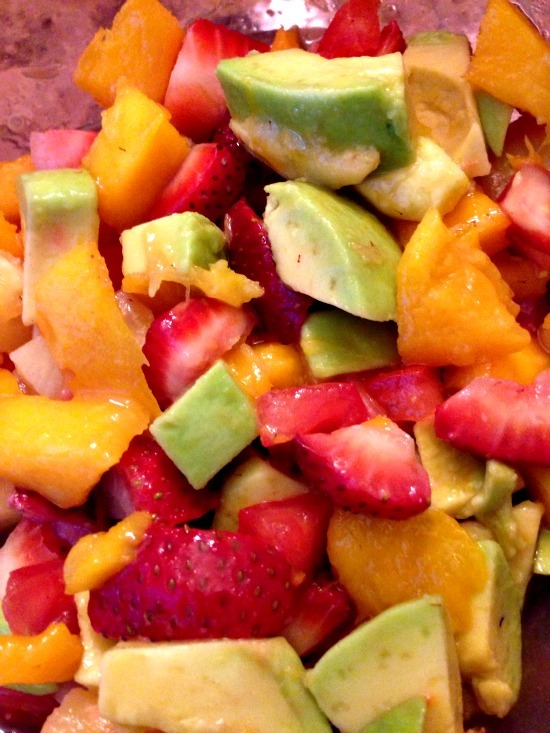 Mango, Pineapple, Strawberry, Avocado, Fruit Salsa - Perfect as a side dish, dessert, or served over a bed of lettuce. Chop all of the fruits and vegetables into bite-sized pieces. Serve as a side dish, dessert, or as pictured over a bed of lettuce with balsamic vinegar and parmesan cheese. I would have loved to share pictures of the mango coconut chicken but my dear sweet husband grilled it for a few minutes too long. All of the wonderful marinade was hard to taste underneath the charred grill marks that were left behind. I guess I need to take over the grilling duties next time but to his defense the chicken pieces were very thick and difficult to grill – he was trying to ensure that the inside was fully cooked. How would you serve this mango avocado fruit salsa? What would you pair it with?